Welcome to Zippy Shell of George Washington University! GWU was founded in 1821 under the name Meridian Hill. It wasnâ€™t until 1904 that the university changed their name to George Washington University after being approach by the George Washington Memorial Association, who wanted to ensure a university commemorating the former president of the United States. Today, the university is home to over 10,000 students who are offered around 90 different areas of study. The main campus of GWU is found in the Foggy Bottom area but the university offers other campus locations throughout Washington, D.C.
Zippy Shell of George Washington University is the best choice for student storage because itâ€™s the most convenient and inexpensive option available in the area. Unlike our competitors, all of our storage containers are kept in a climate-controlled facility for no extra cost to you. Zippy Shell of George Washington University is the most secure facility for your belongings because it is the only facility in the area to not allow any public access. Once you pack up your dorm, the items are brought back to our facility and the next time they are opened is when itâ€™s brought back you. 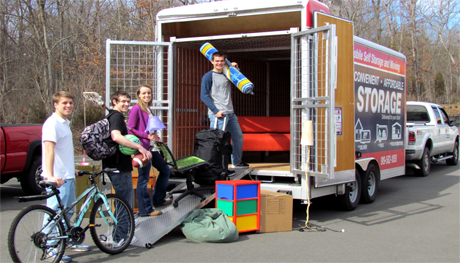 You donâ€™t have to worry about renting a truck or driving to a storage facility because Zippy Shell brings the container right to your door! So whether you are storing for the summer or the semester Zippy Shell is the most convenient and affordable option for you!